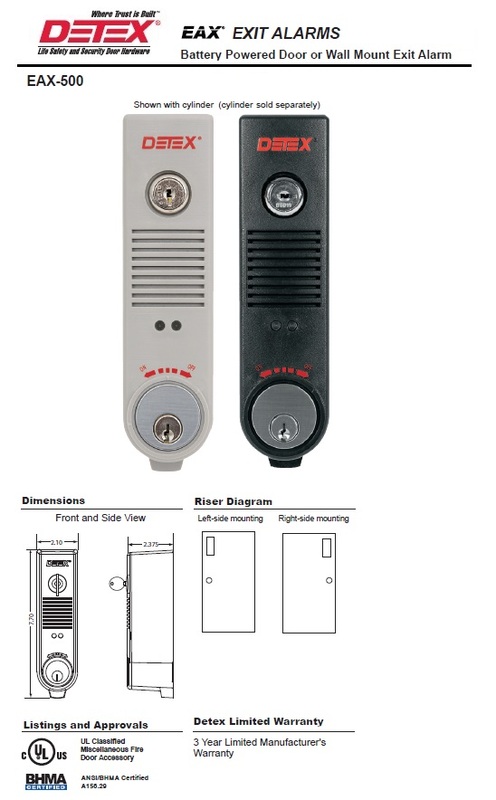 Low Cost, self-contained door alarm with piezo horn that sounds to warn unauthorized use of door or gate. Quick easy installation saves time and money. Patented plastic installation template included for foolproof alignment of device and sensor. Tapered cover allows for installation on narrow stile doors (2" minimum). Intelligent circuit senses the external magnet and sets the proper door handing. Patented cam assembly automatically adjusts for different sizes of cylinders without the use of spacers. Alarm can only be silenced by proper control key. Extended bypass feature allows alarm to bypassed when authorized and will automatically rearm once door is closed. Operated by 9-Volt battery and has a Low Battery Alert (Battery Included). LED visual and audible arming indicators. Available in Grey and Black to match existing and new designs. Mounting hardware is included (Machine and Self-Drilling Screws).